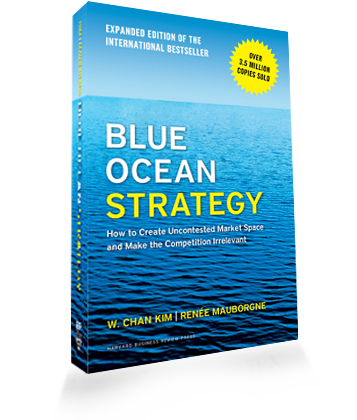 Reading ‘Blue Ocean Strategy’ by W. Chan Kim & Renee Mauborgne. My first attempt at reading this book was during my MBA days because it falls under the “must read” category for all business students. But then we had a project submission…you know what i mean (wink wink). I feel NOW is the right time for me to read this book because what i learn will not end up in a hefty answer sheet…it will be used in the current business environment! I couldn’t agree more with the authors about the over emphasis on beat the competition strategy by companies who are trapped in the red ocean. No wonder the first few slides of all my presentations are competitor analysis. I am not saying that don’t keep an eye on your competition, their products, pricing and marketing approach but it is not exciting anymore to just up your game (enough to beat the competition) on the relative scale. Obviously the plan is not going to work for a very long time because your competition has been watching you all this while and planning their next move. I understand the momentary sense of victory that teams and companies experience when they see sales rising by percentage points in comparison to the former market leaders but is that real victory?! consumers today are not the loyal kind, they are mindful explorers who hustle through the supermarket rows to find the right stuff for them. Offers excite them, discounts please them and yes don’t forget the service that follows. Innovation is a buzzword these days and companies are trying hard to foray into this domain and join the “tech-forward” bandwagon. Interestingly, innovation cuts across business units and verticals in an organization. Production and storage innovation for instance can uplift a company’s operations but the consumer does not directly benefit from it. Also, technology innovations that are way ahead of its time and cost a fortune do not create value for customers. Value Innovation is a critical strategy that aligns innovation with utility, price and cost positions to allow focus on both differentiation and low cost. The diagram above speaks volume and explains the concept beautifully. So next time I am surely going to include a slide on value innovation for my clients who are seeking strategies to grow their business and come out of the bloody red ocean.